In September of 2017, Texas became the 48th state to ban texting while driving. 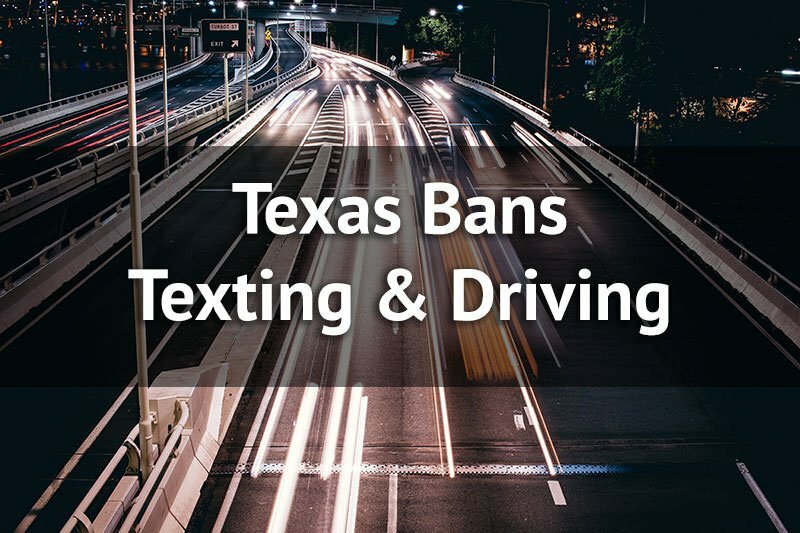 The ban on texting and driving was enacted in response to the devastating impacts people in Texas have suffered as a result of distracted driving. For example, in 2016, Texas saw approximately 500 deaths and over 3,000 injuries from auto, truck and other motor vehicle crashes caused by distracted drivers who were texting and driving. Congress, police and other safety authorities are hoping the ban will curb texting and driving, which will in turn, prevent accidents and save lives. What, specifically is banned by the new law? In general, texting while driving is banned. However, like every law, there are technicalities. If the vehicle is stopped – Drivers over the age of 18 may use a cellphone or wireless communication device. Emergency or Reasonable Belief of an Emergency – Wireless communication devices and cellphones may be used in an emergency or in the event the driver reasonably believes the circumstances constitute an emergency. In general, the “reasonable belief” exception to the emergency exception means you should not get in trouble if you use your cell phone when you think there is an emergency, but there actually is not.. However, this is going to open the door to all kinds of issues for the courts. Can the emergency be your emergency? Are there factors to determine an emergency? Drivers 18 years of age and under are prohibited from using their cellular phone or wireless communication device at any point while operating a motor vehicle. Can I still use my cell phone in my car? Yes, basically, you’re permitted to complete many actions with your cell phone while in your vehicle except for reading, writing and/or sending messages (whether that be a text, email, Facebook message, etc). Using other applications that do not involve holding the device to read, write or send electronic messages. Do I need to get a hands-free device? The legislative law applying to cell phones does NOT necessarily require you need to get a hands-free device. However a hands-free device is encourage for the safety functions it provides. Hands-free devices, which often come in vehicles these days (or can installed), allow drivers to communicate with their device without using either hands (except when their hands are needed to activate or deactivate apps). Takeaway – Basically, you can use a hands-free device to text, but the phone has to be able to read the text back to you. You’re not allowed to read it. Moreover, you can still look at your phone to figure out where you’re going. To be safe, you should probably use a hands-free application to enter the address. Or enter it before you leave. You are not allowed to use your phone in your hand while in a school zone or when or on school property when school is in session or the reduced speed limit applies. Use of hand-held devices is prohibited in school crossing zones and on public school property during the times when the reduced speed limit applies. Can an officer pull me over if he suspects I was texting? Yes. If a police officer sees you using your phone and suspects you are using it in violations of the law, he/she can pull you over. Police are not automatically permitted to seize your phone or make you show it to them prove you were texting. The officer must have probable cause (this is a topic for another blog). You are considered ‘guilty’– If, issued a ticket, you have the right to appear in court with your phone and or phone records to prove you were not in the wrong. What are the penalties for texting and driving in Texas? Penalties for texting and driving vary according to the driver’s record. If he has priors, the fines and punishment can are affected. If you have any questions about the new law that bans texting and driving, the lawyers at Hutchison & Sty, PLLC are here to help. Give us a call or contact us with any questions you may have about the new law.